In addition to all their other blessings, sheep provided the raw material for parchment. After butchering, the shorn sheepskin was laid fleece-side down in a vat of water and lime. Under the caustic action of this alkaline mixture, the remaining bits of fleece and kemp – the wiry under hairs – dropped out, and could be used (mixed with lime as it was) for plastering walls. The sheepskin was rinsed, set up upon stretchers, and then carefully scraped with a sharp, rounded knife (strickle). Any remaining sheep fat or wool-wax was removed by repeated hot lye cleansings. To even the texture and thickness of the skin, it was scoured with fine sand or pumice-like powdered limestone. The skin was left to dry upon its wooden stretcher, then (if scriptorium bound) squared off in sizes for folio (fol, a single sheet folded in the middle), quarto (4to), or octavo (8vo), representing one, four, or eight folds in the skin, respectively. The pages of the largest books such as the Codex Gigas, described below, were made from the single hides of selected animals used as broadsheets sewn in separately. Odd shaped scraps were used for tiny booklets, practice parchment for novice quill-handlers, book spines, and the like. Vellum, generally made from new born calf’s skin, is made similarly. Although the terms parchment and vellum are sometimes used interchangeably vellum is typically of a finer quality and possesses a more luxuriously smooth ‘tooth’ to receive ink and coloured pigments. The base material of those magnificent illuminated medieval manuscripts we cherish came at great cost: one particularly splendid gospel required 1,500 calfskins to make the vellum. The use of other animal hides is far from unknown. Visitors to the Kung. Biblioteket (King’s Library) in Stockholm will marvel over the immense Devil’s Bible (Codex Gigas, literally Giant Book) on display there, made c1325 from the skins of 160 asses. 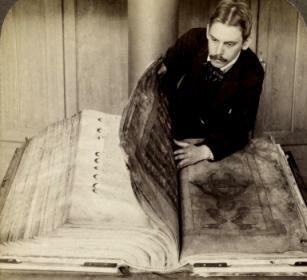 An excellent historic photo of the “Giant Book” – the Codex Gigas, showing how huge it truly is. I was fortunate to see it myself in Stockholm. “Take some goatskins and soak them in water for 24 hours. Take them out of the tub and wash them until the water is clear. Prepare a new bath and add some very old lime and water, stirring thoroughly to a thick, pale cream. Press the skins down into this mixture, folding them so that the fleshy side faces outward. Turn them with a wooden pole two or three times a day, and leave them for a whole week, two weeks in winter. Next, take the skins out of the tub and remove the hair. Pour away the contents of the tub and fill it again using the same mixture as before. Place the skins in the liquid and prod them once a day for a week. Take them out of the tub and wash them thoroughly until the water is absolutely clear. The expense of sacrificing a young animal (who did however, end up on the table) and the time and labour involved in making parchment and vellum enhances the intrinsic value of this remarkably durable material. Medieval parchment was often reused through the ages, suffering every fate from being punched full of holes to serve as grain and flour sifters to being cut into strips to create interfacing for waistcoats. Few of us can now experience turning the leaves of a parchment volume, but simply gazing on a well-prepared and well-inked parchment in a museum brings its own quiet aesthetic pleasure. See also How to Wash a Sheep.